A lightweight, non-electrified net enclosure for chickens and other poultry. Best when used as a monitored day pen for adult birds and chicks. 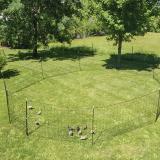 Allows you to move your flock to fresh grass quickly and easily. Features a built-in step-through gate. Because this fence cannot be electrified, we recommend that you move your birds to a safe, secure location at night. NoShock™ Hen Pen will not stop predators. 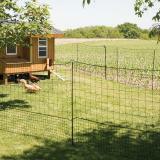 For protection from predators, look to Shock-Or-Not™ Poultry Fence which can also be used a day pen for young birds. 16" height (from bottom) prevents small birds from escaping. Step-in design for added stability in loose soils. Quick access in/out for feeding your chickens. Keep supervised free-range flocks out of flower beds, gardens, patios, roadways, etc. 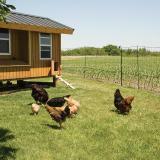 Great for folks with backyard chickens. 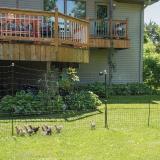 Keep in chicks and ducklings when they are too small to be contained by PoultryNet®. Install around the garden to put ducks on “slug-patrol”. Why do we suggest to energize netting elsewhere but offer non-electric here? Because some folks watch their birds carefully during the day and move them inside at night (far less predator pressure). They can successfully use a fence that is non-electrified. Also, some municipalities do not allow electric fence in backyards. Fiberglass posts (1/2" dia.) are exceptionally stiff and feature offset double spikes: 4.5" and 3". Posts are not pre-installed. Note: Assembling the Hen Pen is more time consuming (and cumbersome!) than our electrified nets because the line posts are not already built into the mesh. This allows you more flexibility for spacing the posts, but it also means more work. 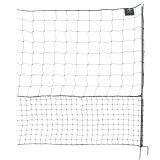 Before installing line posts, stretch the net out in an open area. 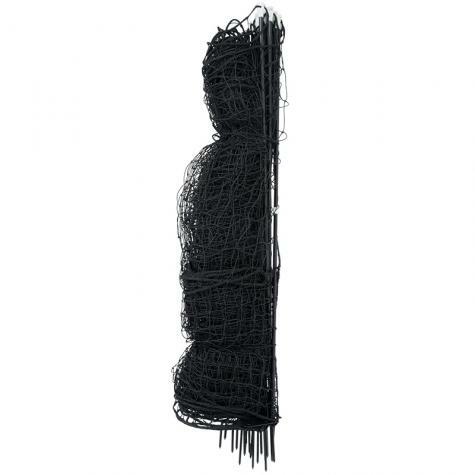 For best results, ensure posts are woven through the mesh using the same vertical columns. The white post caps come detached to allow you to easily weave the line posts into the net without snagging. If desired, an acrylic adhesive can be used to permanently secure them to the post. Many find building a circular pen easier than creating a square or rectangular space. Why? Because measured post spacings are not as critical. To begin, secure the first and last post together. Then create a small circular enclosure with the remaining posts. Progressively expand the circular area outward to add tension. 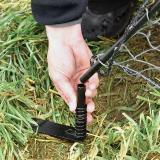 For more support when using a circular enclosure, position the posts so the double-spike faces inward. Consult the assembly instructions (linked above) for additional information. NoShock™ Hen Pen is non-electrifiable. 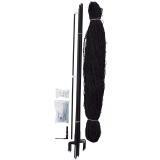 This netting is intended for day pens only, not a night pen. 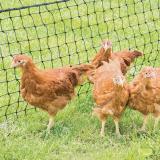 Use it to contain (or exclude) your flock during the day, and either lock them in the coop or behind electrified netting at night. For flighty birds, clip their flight feathers on one wing to prevent escape. Rabbits, chipmunks, mice and other small critters may chew through the nonelectrified strings of the HenPen. These are replacement parts ONLY for the NoShock Hen Pen. Recommended: 16 out of 21 said they would recommend this product to a friend. Let me first state that we love all the fences we currently own but we definitely should have read reviews before we bought this. I wanted to use this for our 8 week old chicks and it kept them in for about 2 days. Then they figured out how to jump up to the bigger holes. Would not recommend for chicks, but a few back yard hens, sure. 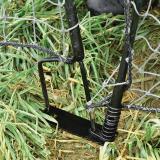 The NoShock Hen Pen is better than trying to create your own fencing. I use both this and something that I made to contain my chickens in a 40’ x 160’ area. 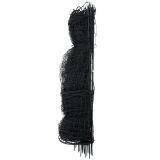 The reason I got this product was because of the thickness of the netting and the gate feature. It is really useful. The gate is a little flimsy but I am modifying it to make it hold better. I have not used chicks with it yet. (I will be in the next few weeks.) I think that the large squares will be too low and that the fencing won’t be able to be used with chicks under 7 or 8 weeks. It takes a long time to assemble. It took me two hours, but I was not installing it in a square or circle. 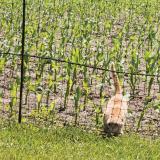 It runs in a zig zag from coop to existing property fence. Depending on how much I continue to like the product, I will purchase two 69 foot kits to replace my home made version. 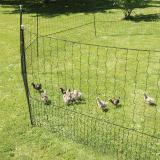 The NoShock Hen Pen fencing is an excellent product of very high quality. Installation is simple and fast - just a few hours. Our 12 hens are enjoying their new roaming yard, and we are looking forward to not having to chase them out of the garden next year. Just get the electric one. Put this up for my 6 week old chicks. Day one was great. Day two they learned to jump up to the bigger openings and climb through. I suppose it might work for full grown chickens. Nice barrier for our dog. Great quality fence material. Instruction pretty hard to figure out. It only took 3 seniors to put fence up. Poles could b sturdier but they do job.